Baby Mmm - you're in the limelight! 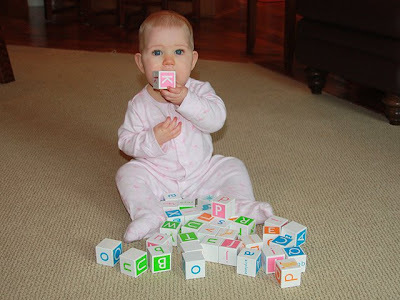 Congratulations to Ava R of Vancouver who won our Limelight Photo Contest with the lovely picture of her enjoying her wooden blocks from Lavish & Lime. After a two weeks, the poll closed yesterday and Ava received a whopping total of 33 votes, narrowly beating Samantha M (28 votes) with her 'Glam Lunch on the Go' shot. Our other finalist photos submitted by Tina M (8 votes), Katie S (4 votes) and Krista P (2 votes) were also enjoyed by all. Thanks to everyone who placed a vote for their fave photo over the last two weeks and we're sure Ava thanks you too. She's won a $50 credit at online boutique Lavish & Lime. A special thanks to all entrants - without you there would have been no contest! Watch this space for more exciting Lavish & Lime contests to come. The baby is so cute. I'd like to give her so many cute crafts I personally made.